The Candida yeast diet guidelines and tips that you’ll discover here are practical solutions to eliminate your yeast infection permanently, as smoothly as possible, and restore your good health naturally. You’ll find out here which foods to eliminate and which foods to favor. Plus, the info you need about specific Candida defense supplements required for restoring the health of your gut and immune system. Also, tips to help you stay on the anti Candida diet with less effort and frustration. Following these specific Candida diet guidelines will help you balance your sugar levels stopping the cravings for refined carbs and sweets, lose weight, eliminate bloating, constipation, those headaches and horrible night sweats, get rid of the many aches and pains… and regain your energy and vitality – all without any medication. Before looking at the foods to avoid or favor, here’s a first tip. To compensate for and neutralize the impact of forbidden foods that (occasionally) you may not be able to avoid I recommend an awesome, all-natural Candida defense: Candidate. Candidate is your secret aid on a Candida yeast diet to stop your Candida overgrowth, increase your metabolism and energy, help you get rid of sweets cravings, prevent localized thrush or yeast infections, restore the probiotic flora in your gut. To learn more click the image at the right. Now, to better understand the following Candida diet guidelines we need a bit of background. If you aren’t familiar with the most common causes of Candida, you should know that Candida Albicans is a naturally-occurring yeast in your intestinal tract, which under some certain conditions that disrupt your intestinal flora and lower your immunity spreads into your bloodstream – and from there, to most organ systems in your body. As you can imagine, what begins as impaired digestion and very likely chronic acid reflux, soon escalates to wild food cravings, extreme fatigue, skin problems, sudden weight gain – to name just a few of the symptoms of Candida overgrowth. You must understand this. Unless you follow specific Candida diet guidelines, this intestinal yeast overgrowth leads to serious symptoms that can make your life miserable. Plus, you must fight a constant resistance to losing weight, no matter how little you eat and how much you exercise. In fact, even if you manage to lose a few pounds, you gain them back shortly, and then more – simply because, with a Candida overgrowth, the neverending food cravings for all kind of high-calorie foods are impossible to ignore. By eliminating the Candida overgrowth in your body, your immune system becomes able to function properly – perhaps for the first time in years – and as a result, your body heals itself. Let’s see now what you should eat and what you shouldn’t on a Candida yeast diet. –> High quality proteins: chicken, turkey, lamb, beef (look for meat from hormone-free, pasture raised animals), free-range eggs, wild fish. –> Non-glutinous grains: amaranth, buckwheat, millet, oats, oat bran, quinoa, wild rice. –> Non-starchy vegetables: asparagus, broccoli, brussel sprouts, cabbage, cauliflower, peppers, tomatoes, onions, zucchini, turnips, radishes, cucumber, kale, eggplant, spinach. Make sure that at least 50% of your diet consists of these veggies, as they alkalize your body and supply the necessary amount of fiber to help restore the micro-flora in your colon. –> Raw garlic is one of the most effective Candida killers: make sure you eat 1-2 cloves of raw garlic daily. TIP: When you need to follow an anti Candida diet, make sure you eat a substantial breakfast; also, don’t skip your lunch or dinner to avoid low blood sugar levels, or else you might experience dizziness, headaches, increased anxiety or irritability. If this happens even when you eat three good meals daily, add a mid-morning and a mid-afternoon snack. Want some specific meal examples? Here’s a full set of sample menus for a Candida free diet. –> All processed and packaged food products containing ketchup, mayonnaise, vinegar, soy sauce, flavor enhancers like MSG (monosodium glutamate) and preservatives. –> Foods that create high acidity, like deep fried foods, fermented cheeses, cold cuts, coffee, colas. –> Sugars, or foods converting to sugar (cookies, breads, pasta and pastries made with gluten-containing flour, alcohol), as sugar causes fermentation in your body. 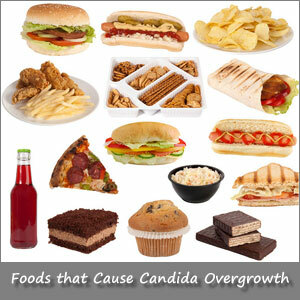 Here’s a more detailed list of foods that cause Candida. If you are like most people, before you’ll feel better, you’ll feel worse on a Candida yeast diet; this can last from a few days and up to 10 days. You may experience an aggravation of your existing Candida overgrowth, condition known as Candida die-off (or Herxheimer reaction). The most common symptoms are body rashes, flu, stuffy nose, headaches, brain fog, fatigue, digestive distress, diarrhea, swollen glands, bladder/kidney/vaginal infections. Well, this Candida die-off reaction is caused by the toxic overload your body has to cope with – i.e., yeast cells being killed off en masse – when your elimination pathways (colon, liver, kidneys) aren’t properly prepped before undertaking anti Candida diet. Your positive mindset is absolutely essential; no matter how bad you feel on the anti Candida diet, do your best to stick to it – know that your persistence will pay off! TIP 1. To help wash away from your body the toxic metabolic by-products that Candida releases as it dies-off, drink plenty of gentle herbal detoxification teas (unsweetened) and water: ideally, drink one large cup of hot water with fresh lemon juice first thing in the morning and sip warm water throughout the day. TIP 2. To help draw the toxins out through your skin and wash them away, take a daily Epsom salt bath in the evening (add 2 cups of salt to warm bath water) or use a sauna for 20 minutes every other day, followed by scrubbing your body with a firm brush and thorough showering. Your most effective Candida defense is the supplementation of your diet with high-strength probiotics (i.e., live yogurt cultures) to repopulate your digestive tract with friendly bacteria. Acidophilus, Lactobacillus Probiotics, Bifobacterium Bifidium and Streptococcus Thermophilus are the most common ones; you’ll find them at your local health food store – follow the recommended dosage on the specific product that you will get. Blackseed Oil (also known as black cumin seed oil, or nigella sativa oil) is a well-known powerful antifungal with no side effects, used for a very long time along with an anti Candida diet. In fact, this multivalent panacea is a BIG help in weight loss, proven to lower blood sugar levels reducing your food cravings and to detoxify the liver, so it can burn fat more effectively. For best results, mix 1 teaspoon (or 2 capsules) of Blackseed Oil with raw honey in a glass of water and take it on an empty stomach first thing in the morning 30 minutes before breakfast and at night, just before going to bed. This delicate oil oxidizes easily, so try to get a high-quality cold-pressed Black Seed Oil. Wild Oil of Oregano is an antifungal extremely effective in killing off Candida overgrowth. Take 3 drops 5 times/day, swallowed with a bit of warm water (always remember to dilute pure Oregano Oil 50/50 with coconut oil or olive oil to avoid tissue damage).Make sure that the Wild Oregano Oil you get for Candida defense is high in naturally-occurring carvacrol (at least 75%), rather than having extra carvacrol added in; also, that it doesn’t have more than 5% thymol, as higher concentrations may be hard on your liver. I recommend purchasing Wild Oregano Oil from Amazon, because it comes in a certified pharmaceutical grade, free of fillers, with an optimal concentrations of active ingredients. Fiber: drink a fiber shake daily with minimum 15-20 grams of fiber to help sweep any undigested waste, toxins, mucus and parasites out from your colon, preventing a Candida overgrowth in your intestine – use psyllium, hemp, chia seeds or ground flax seeds. Green algae like Spirulina and Chlorella restore your intestinal balance and give a lift to your immune system – add a scoop of each in your daily shake. Follow these basic Candida diet guidelines and you’ll starve off your yeast infection, which is responsible for your weight gain and weight loss resistance – among many other nasty things that make s a certified nutritionist anyour life a living hell. …or, if you tried to eliminate your Candida infection before and went through unbearable Candida die-off symptoms, I recommend Linda Allen’s step-by-step Candida cleanse program, Yeast Infection No More. You’ll find that this is a clear, practical and very effective Candida defense program. As a certified nutritionist and a former yeast infection sufferer, Linda guides you through a comprehensive protocol of holistic strategies so you can cure your Candida yeast infection permanently.